IAPB now has an events app! Please search for “IAPB events” on the Google Play store or Apple App store and download it. One app that will include all IAPB events, leading up to the General Assembly in 2020. The IAPB Events app also includes the IAPB Council of Members 2018 on it. Once you setup an account, you will be able to chat with other delegates, mark sessions that are of interest to you, post directly to the news feed and rate sessions. Do you need to setup an appointment with an exhibitor? Get in touch with them on the app. The app also lists speakers and venue maps. You will also find basic information to help you navigate the venue. 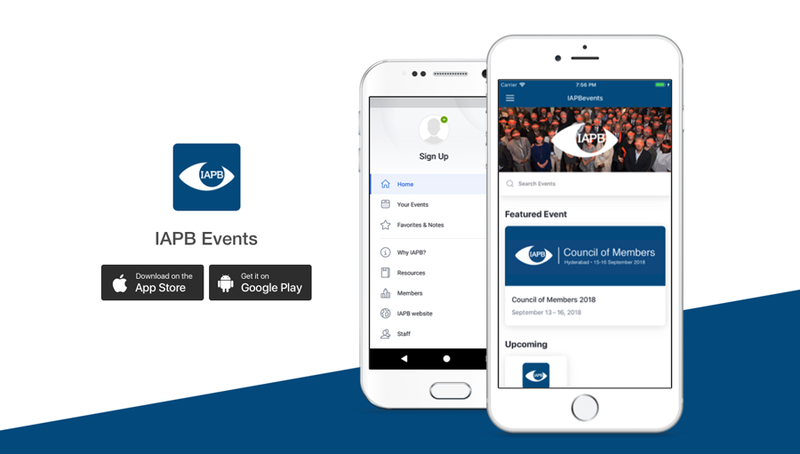 The IAPB Events app is a permanent app—you can use it to access all IAPB events in the future. The app screen lets you choose the latest event—in this case, CoM 2018. Once you are in the event, you can use the hamburger menu (three parallel lines) on the top left-hand corner to navigate around the event information. Do allow the app to send you notifications, so that you know when you receive messages or responses to your questions. You will find the news feed on the home – a space for delegates, speakers and sponsors to share their thoughts about the sessions. You can share a photo, link or text (click on the plus / pencil button to type a message or the camera to send a photo). Make the most of the app by sending a post on the newsfeed. You can also comment on another post or like it. The news feed is where you will see our polls. This year, we will ask you to vote for our photo competition selections—please do let us know your favorites! You may also send a private message to any delegate / speaker registered on the app to let them know you enjoyed their talk. To protect your privacy, private messages can be disabled. Information such as the Wi-Fi passwords (at LVPEI) emergency contacts at the Park Hyatt can be found here.